Standard Process Reviews - Is It a Scam or Legit? If you’re looking to give your body proper nutrition, Standard Process claims that their supplements are formulated with whole food ingredients that give you what you may be missing from a less-than-perfect diet. 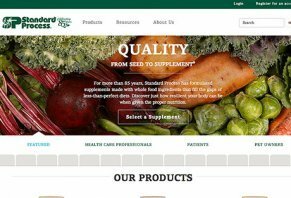 In addition, the ingredients for Standard Process’s supplements are farmed organically and their manufacturing process claims to be one of the most thorough in the industry. But when it comes down to it, do organic ingredients and a stellar manufacturing process mean that Standard Process supplements work any better than ones found at your local health foods store? To put this to the test we performed some research, and here’s what we found. From seed to supplement, Standard Process claims that most of the ingredients found in their more than 160 whole food supplements are grown on their own organic farm, and that they’re rigorously tested for quality and safety. In addition, Standard Process claims that their manufacturing process is precision designed to preserve the nutrients in their raw materials. In fact, Standard Process claims that every batch of their supplements is tested an average of 6 times by their team of chemists and microbiologists. Standard Process – A variety of products claimed to provide safe, effective, high-quality nutritional support. MediHerb – Superior herbal products aimed at healthcare professionals. Veterinary – Supplements claimed to support whole pet wellness through nutritional complexity. Due to the large number of supplements available, you can use the Selection Guide on their website to find one that might meet your needs, and then read through the product’s brochure for a more in-depth look. In addition to supplements, Standard Process hosts a series of educational events throughout the year, and their onsite wellness programs feature chiropractic care, nutrition education, a fitness center, and more. Standard Process supplements are not sold in stores, so you’ll need to contact a healthcare professional in order to purchase them. In order to locate a healthcare professional who sells Standard Process products in your area, you can visit the Health Care Professional Search section of their website. What’s the Bottom Line About Standard Process? With more than 160 supplements, Standard Process manufactures a whole lot of products, many of which contain what could be considered an “excessive” number of ingredients. Many of these supplements include animal parts (e.g. intestines, brains, etc.) and other plant-based ingredients that some consider to have questionable efficacy, and that may cause reactions for those with more sensitive constitutions. In fact, more than one customer has claimed that you can achieve many of the same benefits by purchasing inexpensive vitamins and supplements from your local health foods store. Based out of Palmyra, WI, Standard Process was founded by Dr. Royal Lee and has been in business for more than 85 years. The company holds an A+ rating with the Better Business Bureau, and their website is very informational. With this said, there are no clinical studies available that show the efficacy of their supplements, and the company as a whole has a somewhat spotty history. For a very detailed history about the company, including numerous legal battles with the U.S. government over false claims and even prosecution related to misbranding, please click here. As a whole, Standard Process supplements appear to have a mixed online reputation, with some consumers claiming that their products worked well, while others experienced no benefits whatsoever. Far and away the most common complaints we found during our research are that these supplements are very expensive, in addition to mild-to-moderate reactions such as skin irritation, upset stomach, and other digestive issues. Should you Use Standard Process? While Standard Process’s manufacturing process is one of the most transparent in the industry, the company’s reputation for “less than honest” marketing tactics, high prices, and lack of clinical evidence showing their efficacy might make you think twice before handing over your hard-earned money. I have taken Standard Process Turmeric Forte for about 45 days. I have regained much of the balance that I have lost over the years. I recognize that it does not make claims that it addresses this problem, but at 85 years of age, I am pleased with the improvement and hope that the bioavailability of Turmeric Forte will prevent short-term memory loss. I have been on these food vitamins for many years, I couldn't live without them. We live at a time in life where everything in this world is going to go downhill so getting the right nutrient for your body is a must for me. It protects my heart, kidney, liver, and keeps my blood pressure low. The body is made from dust, so it is natural that your body will respond to this kind of food. May Jehovah continued to bless the work you do for many. Love, love, love them; I don't take anything else. My first experience with Standard Process came from seeing a family friend that was a retired doctor, Bob Pearlman, who has since passed. I had been suffering greatly as my Kidney Disease progressed, and my back ached a great deal constantly. Bob treated me with a few homeopathic medicines and sent me to a local Apothecary with a sheet of things to get. The results where great. The aches subsided, and I regained my energy and a sense of well being, but the dilemma was Bob was moving to Florida. I used the products for 2-3 months. Unfortunately, I ended up on Dialysis a few years later. Now quite a few years pass (about 10 years) and I kept hearing about another doctor that practiced Nutritional Response Therapy. I was open-minded enough to make an appointment. Well, what do you know? The supplements I ordered at his office came to my home by mail, I looked at the small bottles and became excited! This is the stuff Bob gave me, Standard Process (that was in 2009), and I have been seeing him ever since along with my whole family. Sorry if this is long. Two years ago I was suffering from an unexplainable heaviness in my outer thighs and calves. My "chiropractor" advised me to tell my "Family Physician," as it may be a "circulation" issue. The moment I told my "doctor" what was suggested by my "chiropractor," the visit went down hill. He sent me for X-rays, told me I had arthritis in my back and he wanted to prescribe "pain killers" for my back. My chiropractor suggested a Standard Process supplement. Within two weeks, the symptoms are gone! No problem since. I have been using Standard Process supplements for over a month (introduced by Dr. Cory Stern,a nutrition expert), and I can feel the difference. I have more energy, almost no anxiety, and my digestion is better. I am a skeptic by nature, but everything else I tried made no difference, and now I feel better. What else can I say, except that I totally recommend them, as long as you follow directions given by a health care provider. Write a Review for Standard Process!